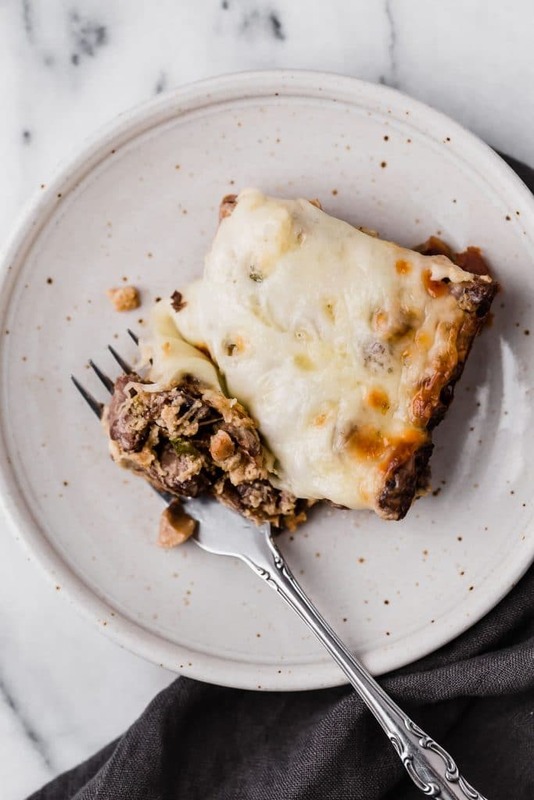 Are you searching for the best low carb philly cheesesteak casserole recipe? 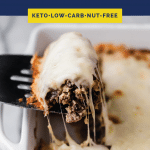 If you are following a low carb diet and love philly cheesesteaks, check out my keto philly cheesesteak casserole recipe! Philly cheesesteaks are wildly popular for a reason… they’re SO delicious! 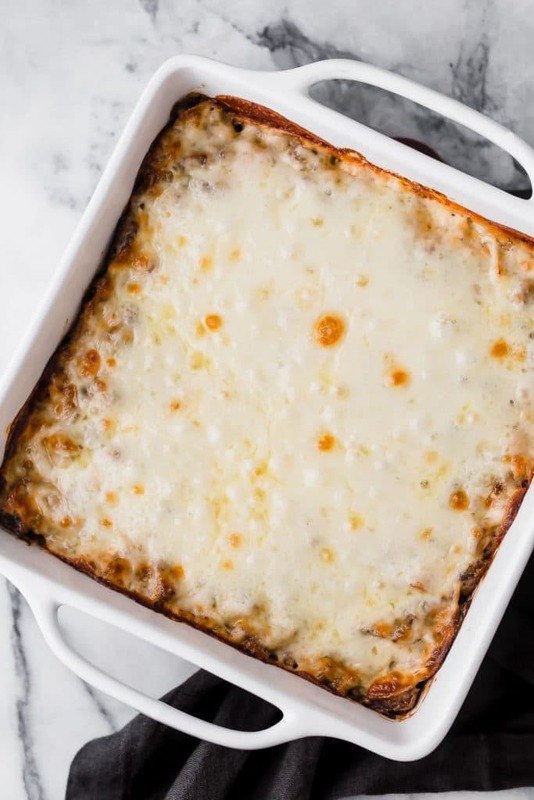 This low-carb CASSEROLE version is no different. Get ready to go on a wildly tasty journey with this delicious meal, complete with mozzarella cheese and yummy veggies like peppers, onions, and mushrooms! 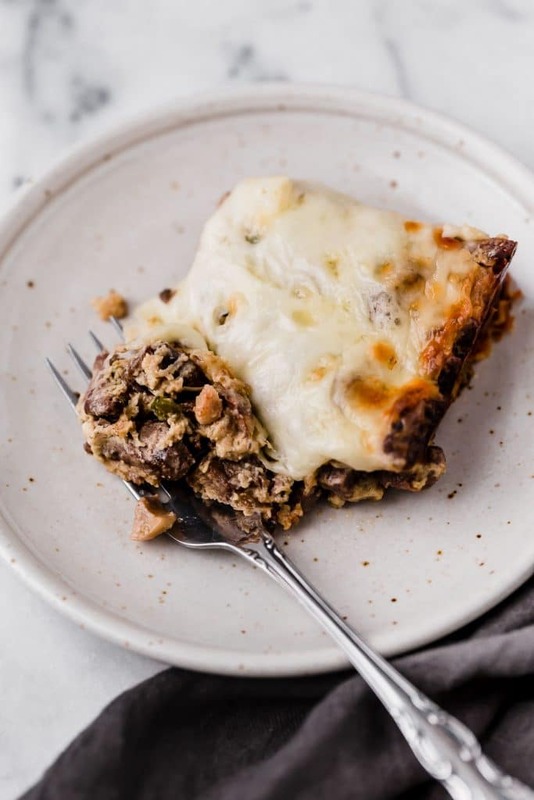 This nut-free, gluten-free, keto philly cheesesteak casserole is ready in just under an hour and will leave you satiated and satisfied for hours! How did Philly cheesesteaks get their start, anyway? The name implies their Philadelphia roots, but surprisingly, cheesesteaks didn’t start inside some big, innovative restaurant. They were actually first created by a hot dog vendor! Hot dog connoisseur Pat Olivieri had the idea to put some fresh, grilled beef onto an Italian roll. Word of the delicious combination spread, cheese was eventually added to the mix, and the rest is history. 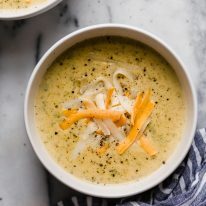 Though we’re skipping the roll to keep things low carb in this recipe, trust me when I tell you that this dish is JUST as history-worthy. For this casserole, I used a 9×13″ pan. If you choose to use a different pan size, note that cook time will change. When cooking your onions and other veggies, they are tastiest and full of flavor as soon as they start to get a golden brown color. Once that happens, they’re ready to take off of heat and enjoy. Cooking to perfection usually only takes about 5-7 minutes. If you like to stay away from red meat and focus on proteins in the turkey and chicken category, that’s ok! You can definitely still enjoy this delicious low carb cheesesteak recipe and sub in a leaner protein at a 1:1 ratio. Brown the meat you have chosen in the pan exactly as directed and follow all remaining instructions to create a dish that you will absolutely love. Note that if you change the type of protein, the resulting nutrition information will not match the recipe card (you will need to calculate the nutrition information on your own). 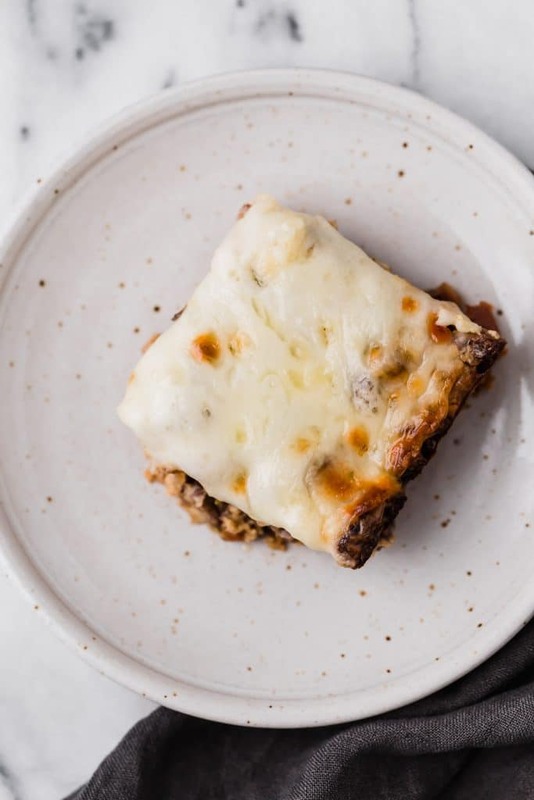 This Low Carb Philly Cheesesteak Casserole is so easy to make! Cutting against the grain, slice steak into thin strips then cut slices into ½” pieces. In a large pan over medium heat, melt butter. Add minced garlic and heat until fragrant, about 1 minute. Add sliced steak and cooked until browned. Transfer cooked steak to plate or bowl and set aside. Discard liquid from pan. To same pan over medium-high heat, add peppers, mushrooms, and onions and cook until vegetables are tender and liquid has evaporated, about 5-7 minutes. Remove pan from heat. Set aside. To a mixing bowl, add egg, shredded mozzarella cheese, cream cheese, pepper, and salt. 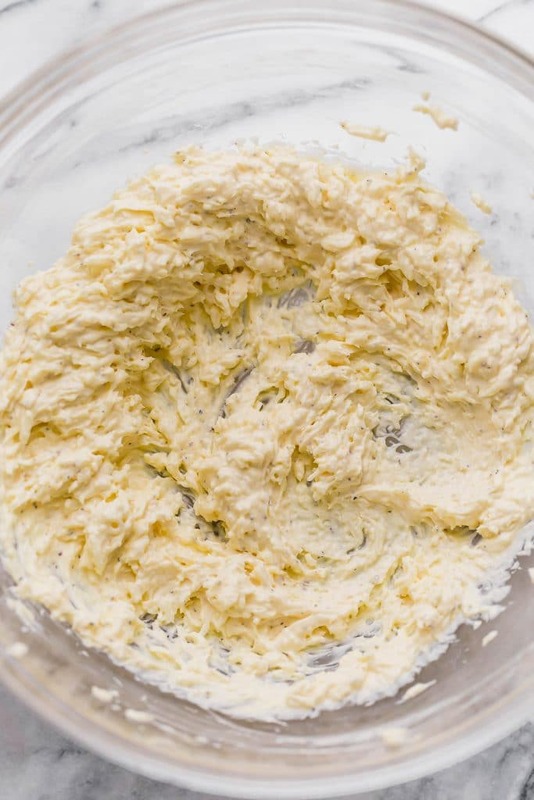 Using an electric mixer, mix egg, shredded mozzarella, cream cheese, pepper, and salt until well-combined. Mix in cooked steak and vegetables. Pour mixture into prepared baking dish and place provolone cheese slices in even layer atop mixture. Transfer dish to middle oven rack to bake until edges of casserole are golden brown and bubbling, about 25 minutes, before removing dish from oven. Allow casserole to cool slightly before cutting and serving. 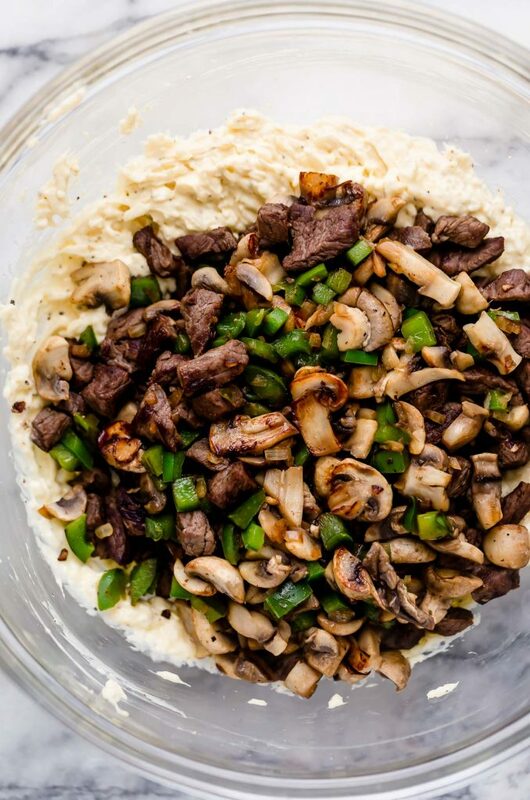 Keto and Low-Carb: This low carb Philly cheesesteak recipe only contains 4.3 grams of net carbs per serving. 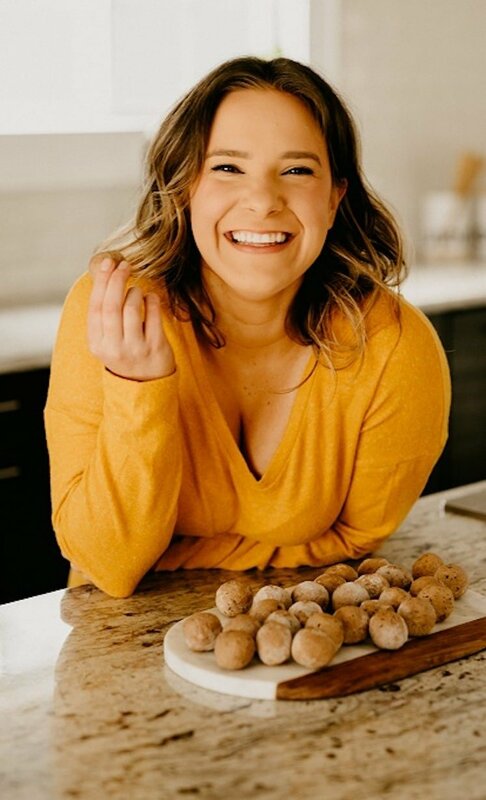 It’s totally keto-friendly! 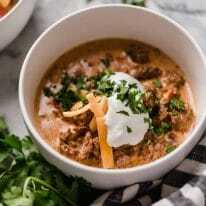 Primal: This recipe follows primal diet guidelines. Gluten-Free: Free of gluten products, this cheesesteak is safe to consume for those with Celiac or other gluten intolerances. Grain-Free: There are no grain products used within this recipe. Nut-Free: Peanuts and tree nuts are not used in this casserole. Coconut-Free: This casserole is free from coconut ingredients. 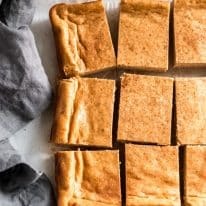 Sugar-Free: There are no sugar products used within this recipe. 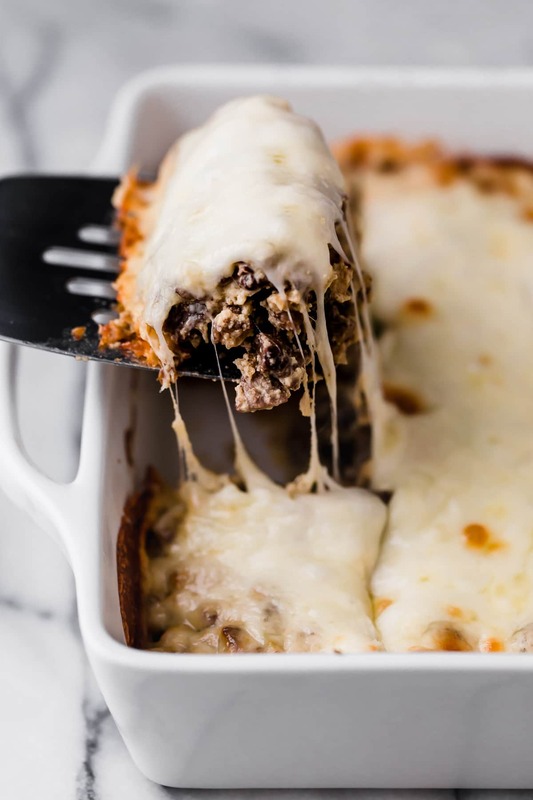 This nut-free, gluten-free, keto Philly cheesesteak casserole is ready in just under an hour! It is low in carbs and absolutely delicious! Cutting against the grain, slice steak into thin strips then cut slices into ½” pieces. Preheat oven to 400 degrees and spray 9×13″ baking pan with nonstick cooking spray. In a large pan over medium heat, melt butter. Add minced garlic and heat until fragrant, about 1 minute. Add sliced steak and cooked until browned. 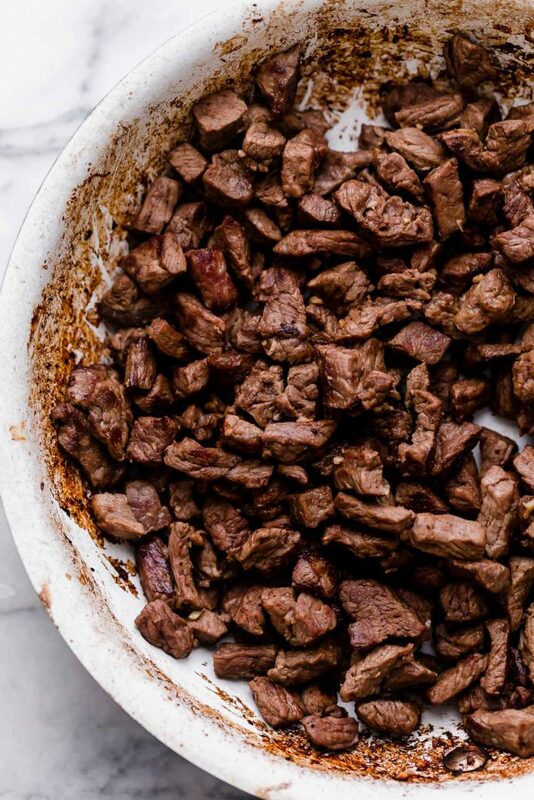 Transfer cooked steak to plate or bowl and set aside. Discard liquid from pan. 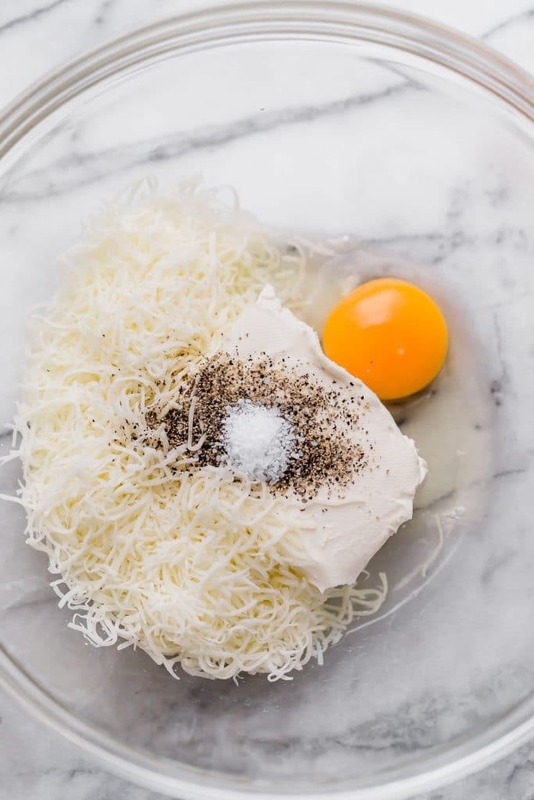 To a mixing bowl, add egg, shredded mozzarella, cream cheese, pepper, and salt and, using an electric mixer, mix until well-combined. Stir in cooked steak and vegetables. Pour mixture into prepared baking dish and place provolone cheese slices in even layer atop mixture. Transfer dish to middle oven rack to bake until edges of casserole are golden brown and bubbling, about 25 minutes, before removing dish from oven. Allow casserole to cool slightly before cutting and serving. 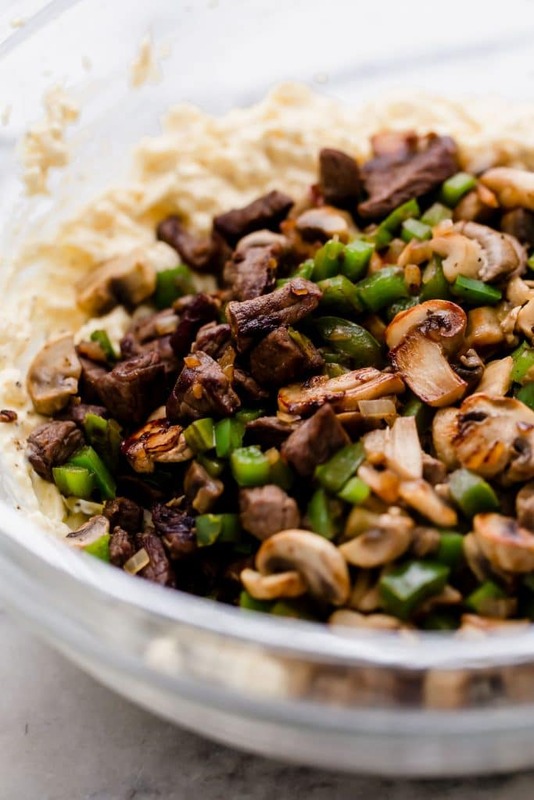 Beef Substitution: You can sub in a leaner protein, like chicken or turkey, at a 1:1 ratio. Brown the meat you have chosen in the pan exactly as directed and follow all remaining instructions. Note that if you change the type of protein, the resulting nutrition information will not match the recipe card (you will need to calculate the nutrition information on your own). Hey, Janice! Thanks for your comment and for noticing my error with “cheddar cheese.” I updated that to reflect mozzarella. Not sure what you mean by not having provolone here though (it’s in both the ingredients and instructions). I always include both metric and U.S. because I have readers all over the world. They always match what is on the product and I do my best to make it clear exactly the amount, especially for people who track their macros and weigh their food.